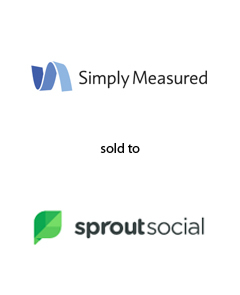 AGC Partners is pleased to announce that its client, Simply Measured, a leading social analytics provider offering the industry’s only full-funnel social analytics platform, has been acquired by Sprout Social, a global provider of social media management, analytics and advocacy solutions. The acquisition will serve to expand the depth of Sprout Social’s current analytics offering and positions the company to lead the social analytics and listening markets. With a team lead by Gee Leung, AGC Partners acted as sole financial advisor to Simply Measured.